As demand for freshly kneaded dough continues to rise throughout Central Florida, so does the bottom line for 14-year-old Douce France Bakery in Winter Garden. 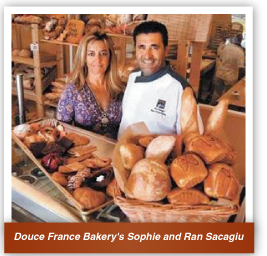 Specializing in artisan breads and French-style pastries, Douce France Bakery expects to hit revenue of $3 million this year. The bakery, owned by Sophie and Ran Sacagiu, spent $2 million building an 11,000-square-foot building in Winter Garden in 2008, doubling the size of the 5,500-square-foot location they were renting on L.B. McLeod Road. That expansion enabled the bakery to go from making about 20,000 pieces of bread and pastry daily at its former plant to 40,000 to 50,000 pieces at its plant near the intersection of State Road 429 and Colonial Drive. “You want to make sure you put money back into the business,” Sophie Sacagiu said. Besides additional capacity, the couple wanted a showroom for customers’ meetings or baking tutorials, a packing and shipping station, as well as a loading dock outback for deliveries. But more importantly, they wanted room for an 800-square-foot, 30-seat cafe where they could serve breakfast and lunch items.